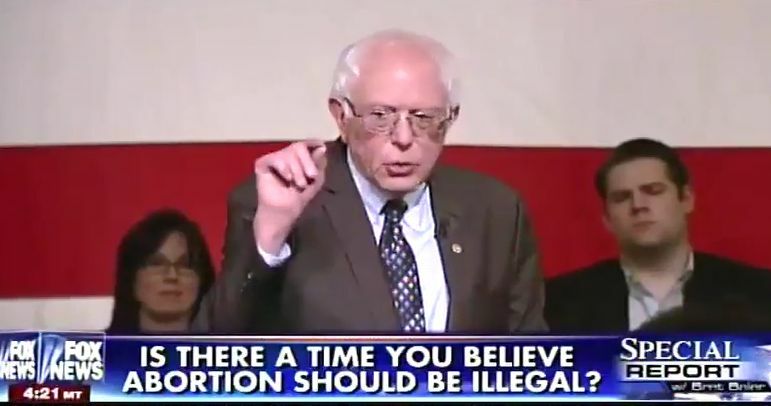 DETROIT, Mich. — Democratic presidential candidate Bernie Sanders expressed his support for allowing abortion without restriction until birth during a televised town hall event on Monday. Sanders, a socialist, attended the event in Detroit to push for votes ahead of Tuesday’s primary. “Can you name a single circumstance at any point in a pregnancy in which you would be okay with abortion being illegal?” Fox News anchor Bret Baier asked. He said that he found it ironic that many who support limited government also believe that the government should get involved in regard to the issue of abortion. Baier then reiterated his initial question asking if Sanders supports any restrictions at all. Last month, the Democratic presidential candidate stated that there is dismay as to why organizations such as Planned Parenthood have endorsed Hillary Clinton over himself as he has long been in favor of abortion on demand. “If you have 100 percent Planned Parenthood voting record—100 percent pro-choice voting record—there are people who are asking, ‘Why is the leadership not either supporting Bernie Sanders or why are they, you know, opposing him?” he said. “As president, Sen. Sanders will only nominate Supreme Court justices who understand that Roe v. Wade is the law of the land and recognize the rights of women to have access to family planning services,” it further explains. When asked if she believes an unborn child should have any protections in the womb, she pointed to Roe v. Wade, claiming that abortion is a mother’s right. “It’s not much of a right if it’s totally limited and constrained, so we’ve got to continue to stand up for a woman’s right to make these decisions and to defend Planned Parenthood, which has done an enormous amount of good work across our country,” she asserted. Nearly 60 million children have been murdered in the womb since the passage of Roe v. Wade in 1973.